UofL is taking a variety of steps to reduce flooding and divert stormwater from the sewers by promoting infiltration and recharging aquifers. The massive, unprecedented flood which hit UofL on August 4, 2009, causing $21 million in damage to 92 campus buildings, was a wake-up call for many. The 7.2 inches of rain which fell in just 78 minutes hinted at the increasing intensity of storms to come as our greenhouse gas emissions continue to warm the planet and alter the climate we once knew. But it also helped motivate us to take action to both mitigate our climate impact, and to adapt to a changing climate by getting serious about sustainable stormwater management. Further flooding on May 29, 2012 not only validated our concerns, but demonstrated that our work since 2009 to enhance stormwater infiltration has begun to pay off. Read more. Want to disconnect your downspouts, too? MSD is offering residential customers $100 per downspout! 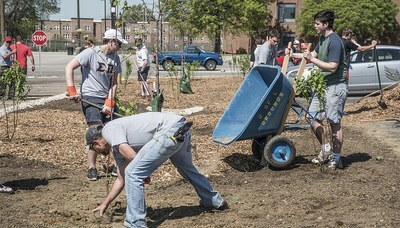 In recent years, UofL made several changes to campus landscaping, parking lots and rooftops, with the help of $1.25 million in cost-sharing from MSD. In 2015, MSD confirmed that UofL's projects are diverting about 72 million gallons of stormwater every year! We think that this significant investment will essentially pay for itself by helping prevent millions of dollars in future flood damage. We are also hoping the projects at UofL will serve as an example for similar projects across the city on both public and private property. MSD's investment in Belknap campus stormwater projects is part of an $850 million agreement that MSD made in federal court with the U.S. Environmental Protection Agency and state regulators in 2005 to reduce the incidence of combined sewer overflows into waterways during storm events. 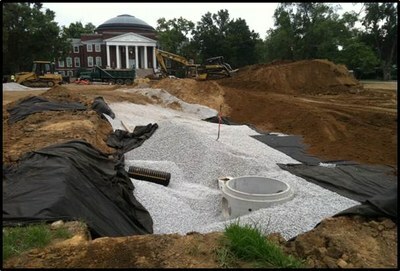 Rain Barrels & Cisterns: UofL installed its largest cistern in 2018 at the Belknap Academic Building. 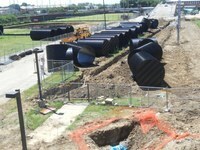 The underground tank holds 50,000 gallons of storm water captured from the roof for irrigation. In 2016, UofL's Conn Center for Renewable Energy Research reinstalled the student-designed Phoenix House on campus with large rain barrels for landscape irrigation. The LEED Gold Student Recreation Center features a 30,000 gallon cistern to capture runoff from the roof (as well as HVAC condensate) for reuse in irrigation. Any excess is returned to the aquifer through a massive infiltration basin (see below). The LEED Gold Clinical & Translational Research Building at HSC also features a cistern to capture HVAC condensate for reuse in irrigation rather than draining to the sewer system. Rainwater harvesting from the roof of the Cultural Center for irrigation of the Garden Commons began in 2011, with a total storage capacity of 600 gallons. 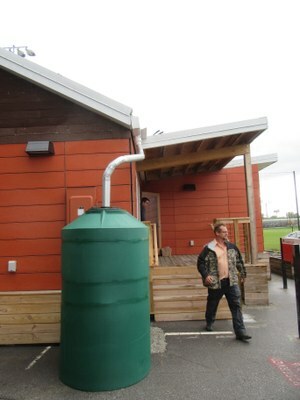 Three rain barrels with a total storage capacity of 350 gallons were installed in 2013 to capture water from the roof of the Urban Studies Institute (426 W. Bloom St.) for use in the Horticulture Zone garden behind the building. Bioswales: Vegetated bioswales are stormwater runoff conveyance systems which provide a natural alternative to sewers. They help reduce threats to water quality by infiltrating the first flush of storm water runoff and filtering the large storm flows they convey. UofL utilizes existing natural drainage swales whenever possible, and enhances them with native plants to encourage infiltration and filter out contaminants. 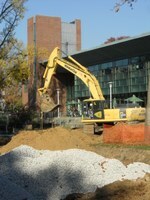 A bioswale was designed to handle stormwater from the roof of the new College of Business expansion. Rain gardens have also been planned for the Law School courtyard and for the area between the Duthie Center for Engineering and the J.B. Speed building, but we lack funding to implement these projects at this time. 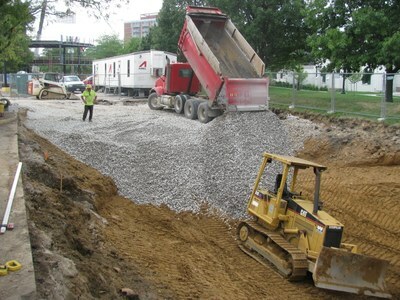 Pervious Pavements: UofL is moving away from the traditional method of creating hardscapes which prevent infiltration and channel stormwater to sewers. Instead, we are creating lots, roadways, plazas, and sidewalks by either: 1. 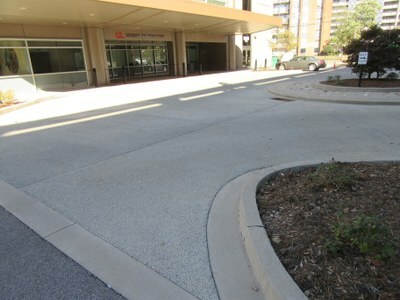 Pouring pervious pavement, as was installed in the drop-off circle at the main entrance of the Dental School renovation in 2012 (with $17k in cost-sharing stipend from MSD); or 2. 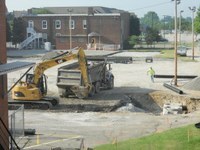 Laying permeable pavers, as have been used in the Red Barn plaza, University Tower Apartments plaza, and Grawemeyer Oval loop renovations, and the Garden Commons community gathering space. 4. a huge vegetated roof installed atop the Cardinal Towne affiliated student housing and retail facility which opened on Cardinal Blvd. in 2011. Belknap Academic Building - This LEED Gold facility was designed to include an infiltration system in the plaza to the west which captures roof run-off from the new building, as well from Shumaker Research Building, Schneider Hall, and Lutz Hall. The system was installed in March 2018. See photos here. 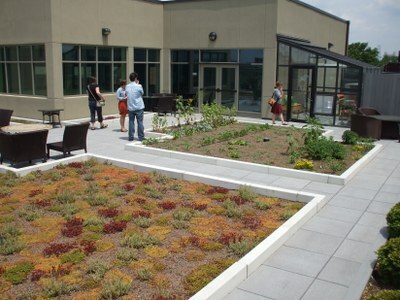 The Nucleus, a 197,000sf LEED-Silver innovation center operated by the UofL Foundation at Market & Floyd Streets, features a 6,000-square-foot vegetated roof and a system that captures 90 percent of stormwater via a retention basin under the building. This project was made possible via a partnership with the Metropolitan Sewer District. Researchers from UofL's Center for Infrastructure Research have installed monitoring equipment to study infiltration rates, storage capacity, and the performance of these designs. In 2014, UofL joined the Universities Council of Water Resources, an association of institutions and individuals representing various fields of natural and social sciences who are at the forefront of education, research, and public service around water resources. Membership provides reduced registration fees to UCOWR conferences for all UofL employees and students, as well as electronic subscriptions to the Journal of Contemporary Water Research and Education, participation in UCOWR governance, networking with other water scholars, and increased visibility as among the leading universities in water-related research across disciplines. Law Professor Tony Arnold (502-852-6388) serves as UofL's lead delegate to UCOWR.